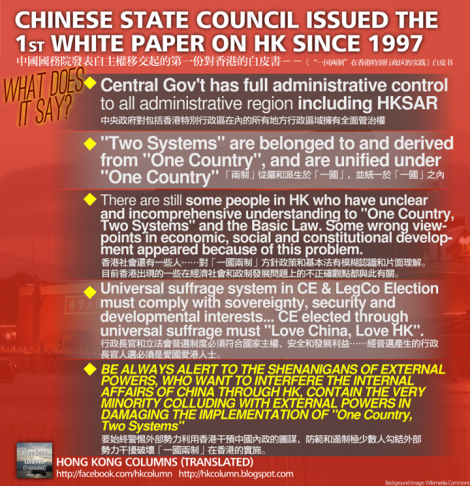 In early July, we sent out a call for poems about the Chinese Government’s White Paper on the “One Country, Two Systems” principle in Hong Kong. At the time, the publication of the paper, which formally precluded true democracy within the city, felt like a watershed moment in Hong Kong history and one that we wanted, in our own small way, to capture in the journal. 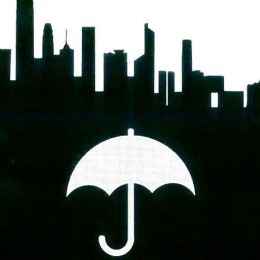 What we couldn’t have foreseen was how the White Paper would lead to subsequent events in the city, especially the Umbrella Revolution. 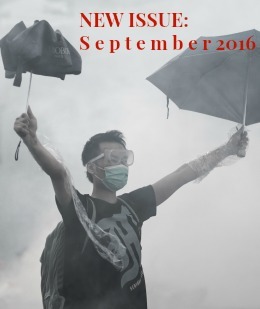 None of us could have imagined how protest sites would blossom on Hong Kong Island and Kowloon or how determined the protesters would be in face of government resistance. Nor could we have foreseen how the protests would leave their mark on the city: the ‘Lennon Wall’ at Civic Square and it’s tapestry of post-its showing how voices are many and one; a solitary yellow umbrella on an Admiralty stage; banners with the words of Lu Xun draped from footbridges. It is within this context that we launch this special feature, which will hopefully serve as a record of our collective desire for democracy. The poems curated here are as much about the experiences of the Occupy movement and the ‘on-the-ground’ protests as they are about the original White Paper. They capture the emotions, reflections and hopes of people living in Hong Kong at this historic moment. This collection is perhaps another “wall” of post-its, reminding us of how the passion for poetry resonates strongly with the passion for freedom and democracy. The March 2012 Hong Kong Poetry OutLoud event will be devoted to a book launch: the debut of Canadian poet Kate Rogers’s second collection, City of Stairs, courtesy of Haven Books and the Hong Kong Arts Development Council. When the subject calls for it, Rogers’ writing can be delicately wistful, potently visceral, ecstatic, sensuous, or richly contemplative. The many striking, insightful portraits of strong women show an equal adeptness with the contemporary and the mythic – and their overlaps. This book is a treasury, and a real tour de force. Canadian poet and educator Kate Rogers has had poetry, essays and reviews published in anthologies and literary magazines in Hong Kong, Taiwan, Canada and the UK. She has been short-listed twice for the Winston Collins Best Canadian Poem Prize by Toronto literary journal Descant. 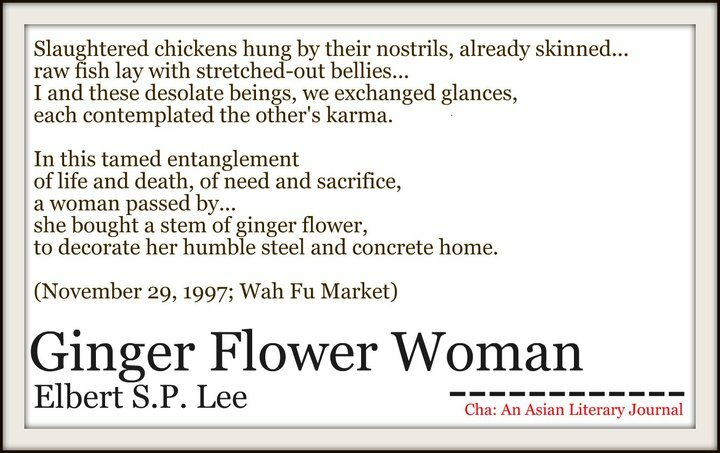 Her work has appeared in Fifty-Fifty: New Hong Kong Writing; The Asia Literary Review, Dimsum; Pressed; Crave it; Many Mountains Moving; Dream Catcher; The New Quarterly, Contemporary Verse II, Canadian Women’s Studies, The Mad Woman in the Academy and Orbis International. She has traveled extensively in Asia and in Southern Africa. A bilingual collection of her essays about conservation in Taiwan, The Swallows’ Return, was published in 2006. Her first collection of poetry, Painting the Borrowed House, debuted in Hong Kong in 2008 with Proverse Publishing. Not A Muse: the Inner Lives of Women, co-edited by Viki Holmes and Kate Rogers; Haven Books; appeared in 2009. Poetry doesn’t get better than this! 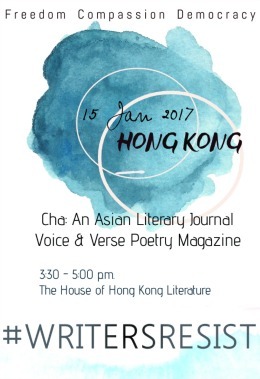 This Friday, if you are in Hong Kong, you should attend Poetry Jam, an evening of poetry organised by Poetry OutLoud Hong Kong, hosted by Viki Holmes. The event is part of the Hong Kong International Literary Festival 2011. 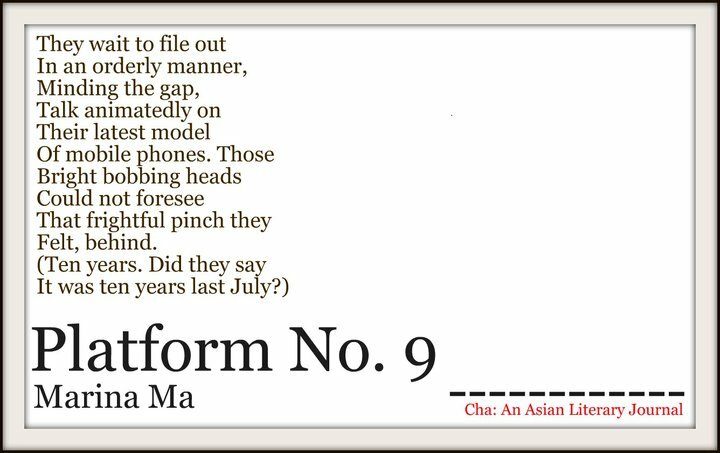 Eight Cha contributors will be reading — click the images below to read their works in Cha. Other participating poets include Akin Jeje, Gillian Bickley, Jason Polley, Nashua Gallagher, and more. When I go back to Hong Kong, I wish to campaign for putting poetry, both Chinese and English, in public transport. Larger versions of these images for non-commercial purposes can be obtained from Cha editors for free. Please contact editors@asiancha.com. 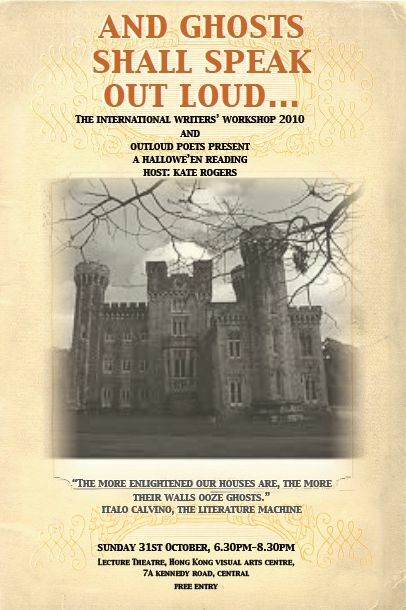 October is coming to a close and what better way to see in November than with a spooky poetry reading featuring writers from the International Writers’ Workshop and our local Outlouders? 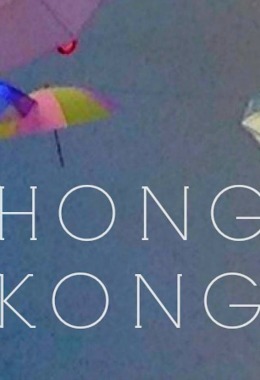 Enjoy an evening of poetry and jazz with poets from the International Writers Workshop and some of the best Hong Kong-based writers, including Kate Rogers, Nicole Wong, Adam Radford and Jason Lee. Mark Peter provides musical accompaniment, Viki Holmes MCs. 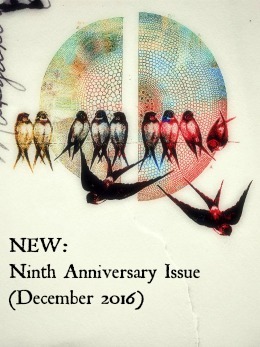 Kate Rogers’ poetry was published in issue#9 of Cha. 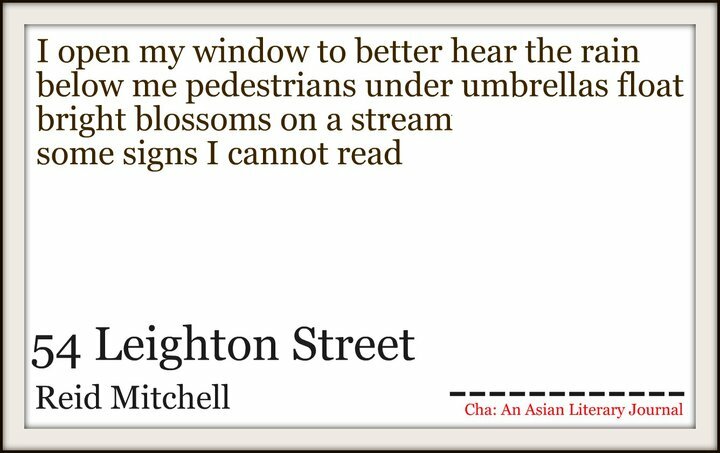 Jason Lee’s “45 Belgrave Square” was published in the February 2009 issue of Cha and nominated for a Pushcart Prize. Read an analysis of the poem here. Viki Holmes’s poetry was published in issue#3 of Cha. We are happy to announce that the following pieces of work have been nominated by Cha for inclusion in Best of the Net Anthology 2010, published by Sundress Publications. Congratulations to these writers and good luck! Also see our Best of the Web, Pushcart and Micro Award nominations this year. Iris A. Law’s “Circumnavigation”, first published in Issue #7 of Cha, was selected for publication in Best of the Net 2009. 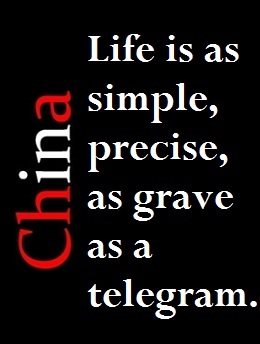 -Xu Xi’s creative non-fiction was published in issue #6 of Cha. -Kate Rogers’ poetry was published in issue #9 of Cha. 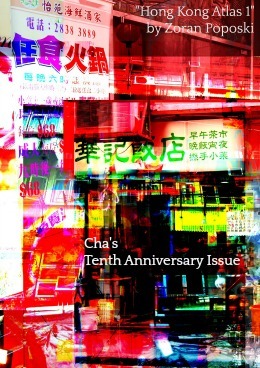 Several Cha contributors have creative works published in the new issue of Asia Literary Review (Vol. 16, Summer 2010). 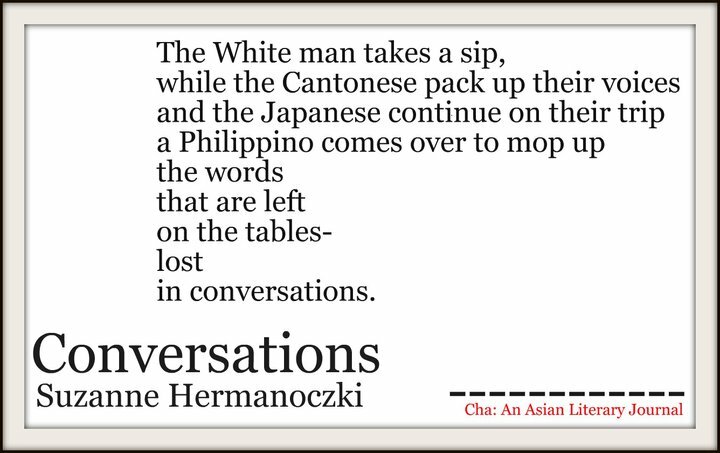 Read O Thiam Chin’s “Grasshoppers“, “Turning a Blind Eye” and “Fireworks“; Steven Hirst’s “It’s All in the Silhouette“, Kristine Ong Muslim’s “Not Sleeping“; Ocean Vuong’s “The Photo” and “Ars Poetica“; and Kate Rogers’ “A Paper House” in the new issue. 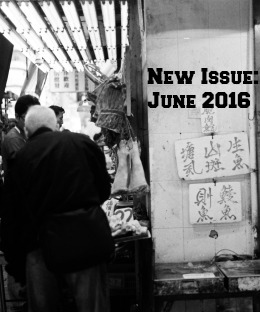 Steven Hirst’s photography has been published in issue #11 of Cha. 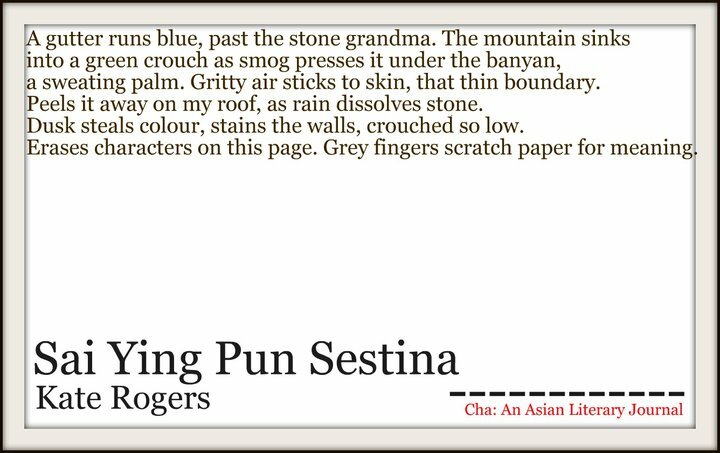 Kristine Ong Muslim’s poetry has been published in issue #9 of Cha. 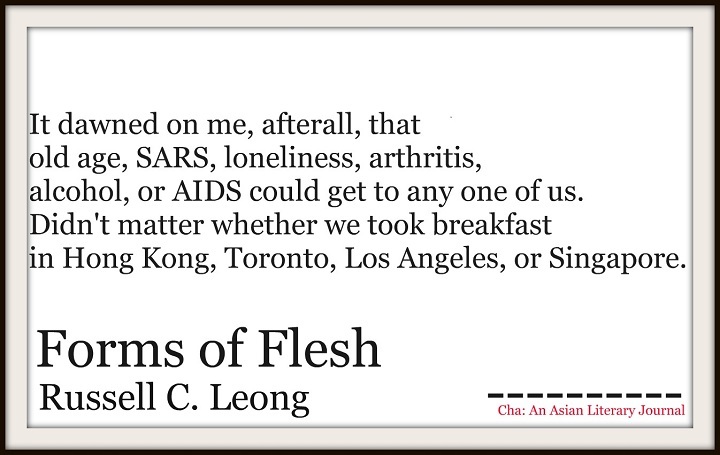 Ocean Vuong’s poetry has been published in issue #10 of Cha. Kate Rogers’ poetry has been published in issue #9 of Cha. 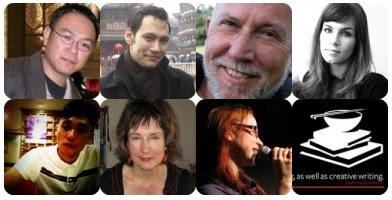 Cha contributors Martin Alexander, Andrew Barker, Blair Reeve, Jason Lee, Ouyang Yu, Kate Rogers, Viki Holmes and Xu Xi will be featured in the 2010 Man Hong Kong International Literary Festival (11-19 March). More details can be found here. Read Martin’s “Smashing Up the Grand Piano” [and an anslysis of the poem], Andrew’s “Welded to Reason by Brittle Metals” [and a review of his Snowblind from My Protective Colouring], Blair’s “Of Horologists & Jazzologists” and “Periplaneta Maldiviana”, Jason’s “45 Belgrave Square” [and an analysis of the poem], Ouyang’s “Bad English” [and an analysis of the poem], Kate’s “Sai Ying Pun Sestina“, Viki’s “smoking double happiness at the grand stage dinner & dance” and Xu Xi’s “Confucius and Hair” in Cha. Performing poets include Joy Al-Sofi, Nashua Gallagher, Claire Lee, Erica Lyons, Aaliya Zaveri and Cha contributors Viki Holmes and Kate Rogers. Mark Peter will be performing music. 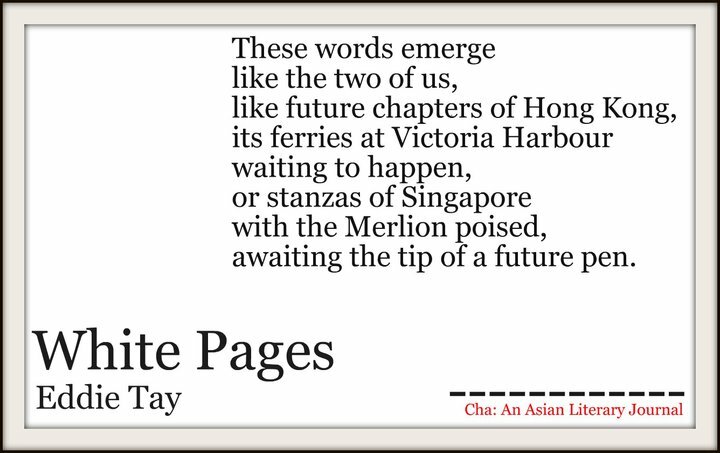 Kate Rogers’s review of Ching-In Chen’s The Heart’s Traffic: a Novel in Poems and Todd Swift’s Seaway: New and Selected Poems was published in issue #8 of Cha.